Can You Guess Which Country Is About To Launch A New Gold Bullion Coin? The U.A.E., of course. The home of the world’s tallest building is eager to prove that the Dubai default never happened and they really are home to unlimited wealth. 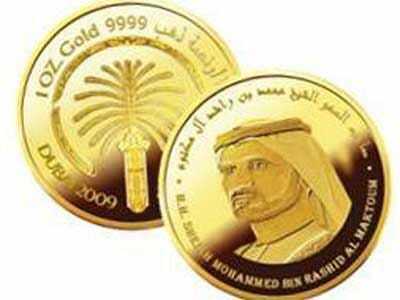 The proposed gold tender would follow several commemorative coins launched by the Emirates (pictured). Other gold coins in circulation include the South African Krugerand, the British Sovereign, the Australian Nugget, and the Canadian Gold Maple Leaf. The coin that is now being discussed, will have HH Sheikh Khalifa bin Zayed al Nahyan on one side and Burj Khalifa on the other. “We believe this is an image that will represent the UAE,” says Ahmed Bin Sulayem, executive chairman of Dubai Multi Commodities Centre to 7DAYS. He also pointed out that this was a great time to launch the coin as “the level of interest in gold investment is the highest it’s ever been“. But what happens when two bubbles collide?